An Achievement Report is essential for the owner or for an agent as it boosts the enthusiasm of the person. Kudos is all about the ratings of agent's profile whether they have got a good response or the bad one from the customers. It also displays whether the agent is a star performer or a mediocre one. 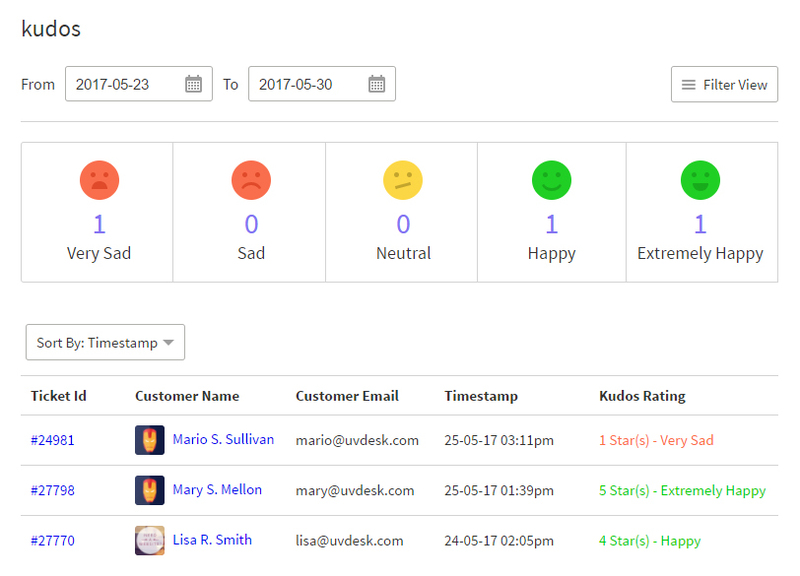 In the Kudos section within the Reports, the owner or the agent can see the ratings provided by the customers for their support. The agent or the owner can see Ticket Id, Customer Name, Customer Email, Timestamp on which Kudos Rating is provided by the customer. In the Filter View, the owner or the agent can see the Kudos Rating by selecting any particular Agent, Group, Team, Type, Priority.